The technology giant, Google, and Israel announced Tuesday that they are teaming up to give researchers and the public the first comprehensive and searchable database of the Dead Sea Scrolls — a 2,000-year-old collection of Hebrew, Aramaic and Greek documents that shed light on Judaism during biblical times and the origins of Christianity. No one knows who copied these ancient texts or how they got there. The scrolls include parts of the Hebrew Bible as well as treatises on communal living and apocalyptic war. Over the years, the texts have sparked heated debates among researchers over their origins.Some believe the Essenes, a monastic sect seen by some as a link to early Christianity, hid the scrolls during the Jewish revolt of the first century A.D. Others believe they were written in Jerusalem and stashed in caves at Qumran by Jewish refugees fleeing the Roman conquest of the city, also in the first century. Spanish Jesuit Josep O'Callaghan-Martínez has argued that one fragment preserves a portion of text from the New Testament Gospel of Mark 6:52-53.In recent years, Robert Eisenman has advanced the theory that some scrolls actually describe the early Christian community. The Dead Sea Scrolls are a collection of 972 documents, including texts from the Hebrew Bible, discovered between 1946 and 1956 in eleven caves in and around the ruins of the ancient settlement of Khirbet Qumran on the northwest shore of the Dead Sea in the West Bank. For years, experts have complained that access to the scrolls has been too limited. Once the images are up online, anyone will be able to peruse exact copies of the original scrolls as well as an English translation of the text— for free. Officials said the collection, expected to be available within months, will feature sections that have been made more legible thanks to high-tech infrared technology. "We are putting together the past and the future in order to enable all of us to share it," said Pnina Shor, an official with Israel's Antiquities Authority. 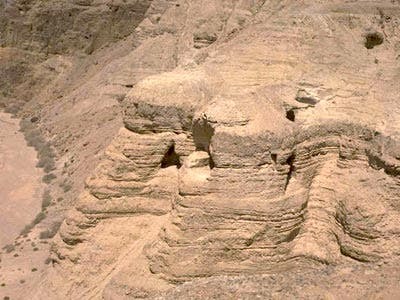 The Dead Sea Scrolls were discovered in the late 1940s in caves in the Judean Desert and are considered one of the greatest finds of the last century. After the initial discovery, tens of thousands of fragments were found in 11 caves nearby. Some 30,000 of these have been photographed by the antiquities authority, along with the earlier finds. Together, they make up more than 900 manuscripts.For decades, access to 500 scrolls was limited to a small group of scholar-editors with exclusive authorization from Israel to assemble the jigsaw puzzle of fragments, and to translate and publish them. That changed in the early 1990s when much of the previously unpublished text was brought out in book form. Even now, access for researchers is largely restricted at the Israel Museum in Jerusalem, where the originals are preserved in a dark, temperature-controlled room. Putting the scroll online will give scholars unlimited time with the pieces of parchment and may lead to new hypotheses, Shor said. "This is the ultimate puzzle that people can now rearrange and come up with new interpretations," she said. Scholars already can access the text of the scrolls in 39 volumes along with photographs of the originals, but critics say the books are expensive and cumbersome. Shor said the new pictures — photographed using cutting-edge technology — are clearer than the originals.The refined images were shot with a high-tech infrared camera NASA uses for space imaging. It helped uncover sections of the scrolls that have faded over the centuries and became indecipherable. "The more accessible the fragments are the better. Any new line, any new letter, any better reading is a great happiness for scholars in this field," she said.The new partnership is part of a drive by Google to have historical artifacts catalogued online, along with any other information. For the last 18 years, segments of the scrolls have been publicly displayed in museums around the world. At a recent exhibit in St. Paul, Minn., 15 fragments were shown. Shor said a typical 3-month exhibit in the U.S. draws 250,000 people, illustrating just how much the scrolls have fascinated people.